America's love affair with food trucks is going strong. In the past year, customer searches for food trucks and carts have surged on Thumbtack.com, a site that connects more than a million small businesses with prospective clients. 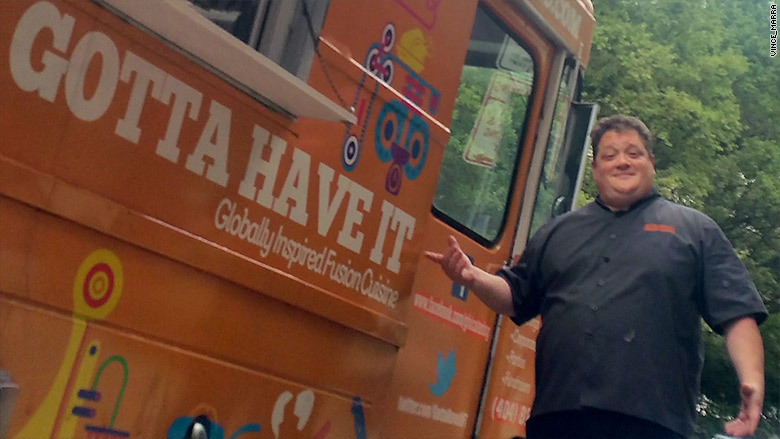 "Our food truck business has exploded since last year," said Vincent Marra, owner and executive chef of Gotta Have it, an Atlanta food truck. Customers are hiring him 10 to 25 times a week for weddings, corporate events and private parties. He said business has grown 110% in the year and a half since launching. "People like the novelty of it," he said. "And it can be 25% to 30% less expensive than full catering." He said the upfront cost to launch a food truck business is a minimum $55,000. "You can recoup that within a year. We did, but that's rare," said Marra. "Be aware that this isn't a get rich quick type of business."